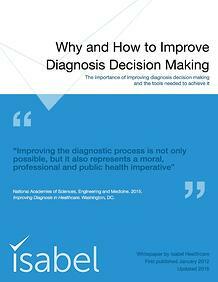 Get the White Paper on diagnosis decision making! Learn "Why and How to Improve Diagnosis Decision Making" in the White Paper by Isabel Healthcare, Forward by Mark Graber, MD. Diagnosis is the first and most important decision made about the patient. It determines all subsequent treatment and the course of each patient encounter. How well this decision is made, therefore, is one of the most significant determinants of healthcare quality and efficiency. You will also hear from Mark Graber, MD, professor and patient safety expert, on how to avoid diagnosis errors.